A man reported horrible smells emanating from the unit after winning its contents during an auction. Further examination revealed a ghoulish collection of human organs in various states of decomposition, all stored in makeshift containers including 32 oz. soda cups and plastic storage containers. The former examiner, Dr. Michael Berkland, was relieved of his official duties in 2003, but had conducted a number of private autopsies during his time in the area. Authorities are unclear who the organs belong to or why they were in the storage unit. In 2007, in Maiden, North Carolina, a man bought a smoker at a police auction of abandoned items from a storage facility. When he opened up the smoker, he discovered what he thought was wood wrapped up in paper. The bundle instead turned out to be a human leg that had been amputated at just above the knee. Police contacted the owners of the storage facility. 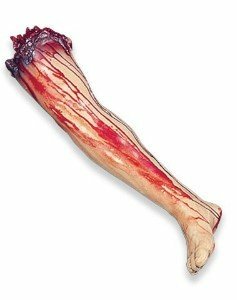 It turned out that the owner’s son had had his leg amputated after a plane crash and kept the leg for “religious reasons.” She and her son drove some thirty-five miles to retrieve it from the man who had bought the smoker. It gets better, though! I love this story and I’ve told it on radio interviews a number of times when asked what my favorite “shocking” story from the book is. During an interview with a radio station in North Carolina I received a follow-up to the story from one of the show hosts. They said that not only did they remember the story but it actually didn’t end there. Apparently the amputee didn’t get his limb back without a fight. The now-owner refused to give it up, saying it was his property. So the “original” owner of the leg had to go to court to get his limb back. But wait, that’s not all! They went to COURT TV!!!! And guess what? The amputee had to pay $5000 to win his leg back. That’ll teach him! Ah, you just can’t make stuff up anymore bizarre than real life. This entry was tagged autopsies, Bizarre News, death, human remains, storage wars. Bookmark the permalink.